"IPHIS sees on the promenade a shoe of a new Fashion; it sees hers, and it blushes; it no longer believes itself dressed; it came to be shown, and it hid; here it is restrained by the foot in its chamber all the rest of the day." It is there without a doubt what led Circe to say, some time ago: "Yes, if it was necessary, I would go to Rome to find Fashion; I am jealous of pleasing, and I know how much it adds to the means. "* This homage is very sincere. Here is Fashion, and it comes to introduce itself to you. 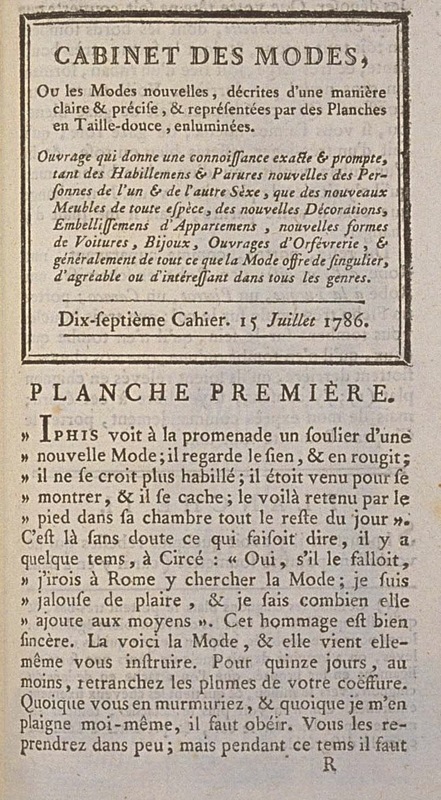 For fifteen days, at least, retrench the plumes of your coiffure. Though you murmur about it, and though I complain about it myself, one must obey. You will take them up again in a short time; but during these times one must depose them. Your head may only be covered with a Chapeau-Bonnette, whose brim falls en toît all around, and whose crown, very puffed, and very large, may be tied with a ribbon, forming a large bow in the back. This is your whole coiffure. 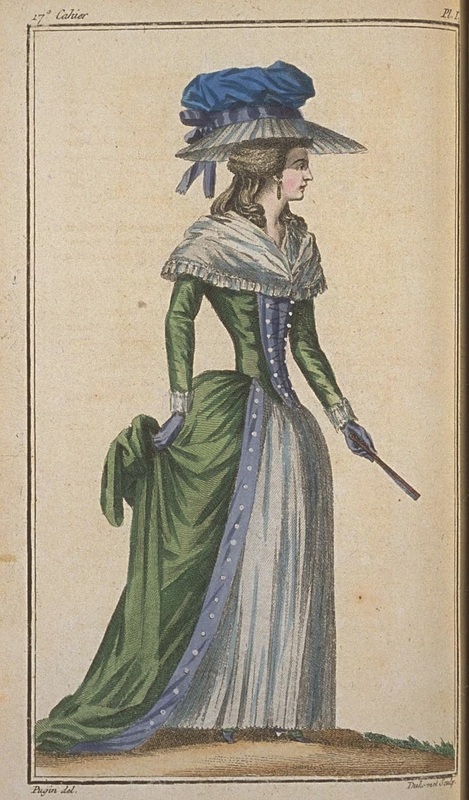 This Hat may be of blue gauze, or, if you like it better, pink gauze; it may be of a very light blue or pink taffeta, and tied with a violet ribbon, or a white ribbon; but there is nothing more: I want it. I only change it for the parure; but it pleases me to change it. 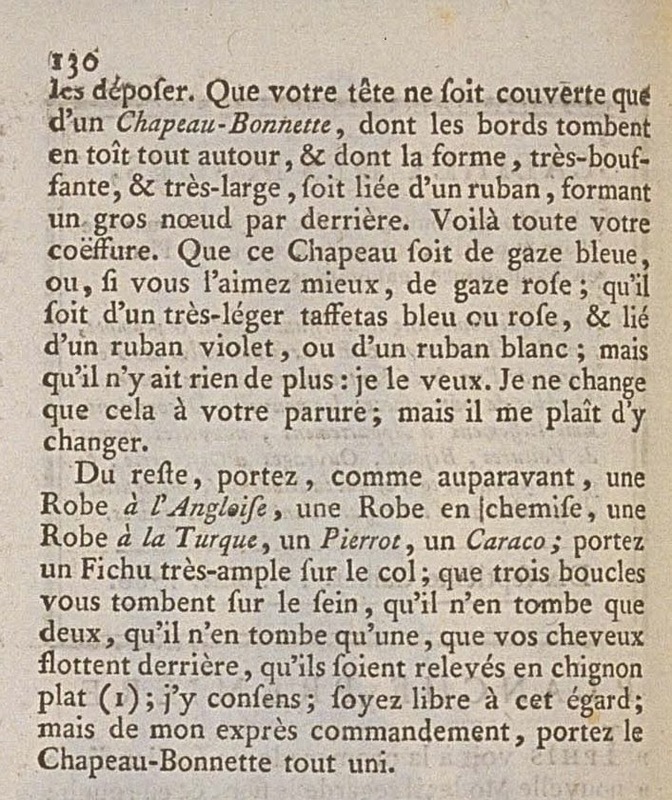 For the rest, wear, as before, a Robe à l'Anglaise, a chemise Gown, a Robe à la Turque, a Pierrot, a Caraco; wear a very-ample Kerchief on your chest; three curls may fall on your chest; two may fall, one may fall, your hair may hang behind, it may be pulled up in a flat chignon (1); I consent; be free in this respect; but by my express command, wear the Chapeau-Bonnette, all plain. (1) As the flat chignons are worn very-low, and it is impossible that all the hair be long enough to be carried back to the comb that holds them up, some days ago a sort of ligament in bronzed iron was invented, that is attached inside the chignon, around the middle, and which holds the hair fixedly embraced. They are no longer seen to detach, fall in scattered threads on the chest, and present to the eye a disagreeable mat. * Iphis is a character in Handel's oratorio Jephtha (1751); this may be related? Circe is from The Odyssey, which has had various adaptations.